I started teaching myself how to crochet earlier in the year as a way to relax. I follow quite a few crafty bloggers, and several of them excel at crochet. Was I missing out on all that fun? These clever crocheters seem to pick it up and put it down as casually as a grocery list. 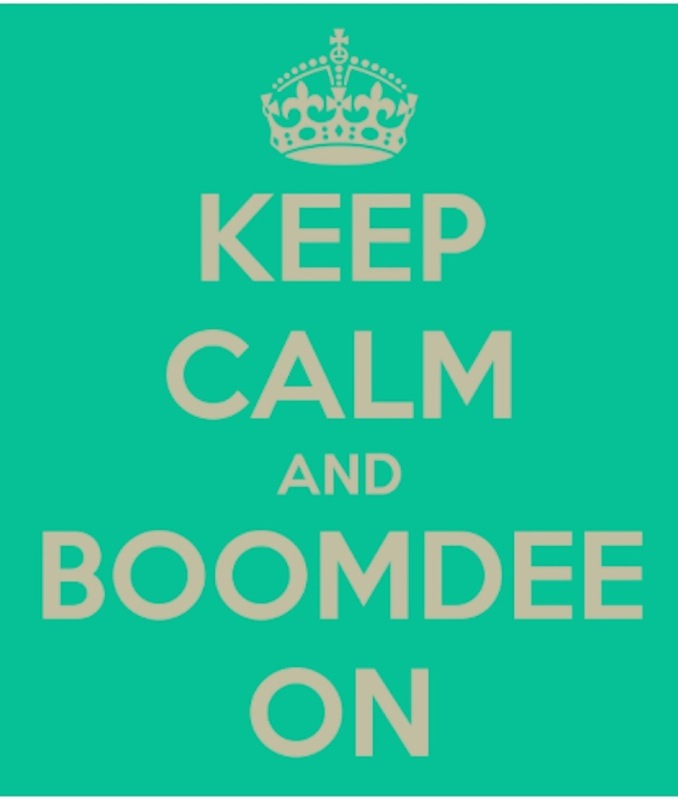 I’ll even venture to guess that a few of you have a hook dancing in your lap as you read this. I learned to sew at the age of six and our mom taught us the basics of knitting a few years later, but crocheting wasn’t part of her repertoire. I learned how to make a chain, and my skill set ended there. It’s been slow going, but crocheting is as relaxing as I knew it would be, after I mastered a few knots. The book-learning bores me to tears, but once I get the hang of a stitch, my shoulders drop and the soothing rhythm I craved takes over. During a comment conversation on Tall Tales From Chiconia, I offered to send Kate a couple of large crochet hooks in a size she couldn’t find at home. Kate graciously offered to make me something in return. I know she’s pleased to have a pair of plastic crochet hooks in sizes N and Q, but I’m over the moon at what she offered in return: this gorgeous, handcrafted tool roll in all my favorite colors! As I cast my eyes on this lovely thing, I keep reminding myself that it’s a tool roll, not a museum for lonely crochet hooks. The heat will pass, our busy kitten will mellow and I will sign up for a class to further my skills so that I can continue with this relaxing craft, turning out something I don’t mind bringing out into the light of day. That said, and in the spirit of Jan’s garden post, here are the meager beginnings of what I hope to call craft one day. Thank you once again, Kate, for this beautiful, thoughtful gift. Mouse is fine with the hobby, as long as he still fits in my lap. 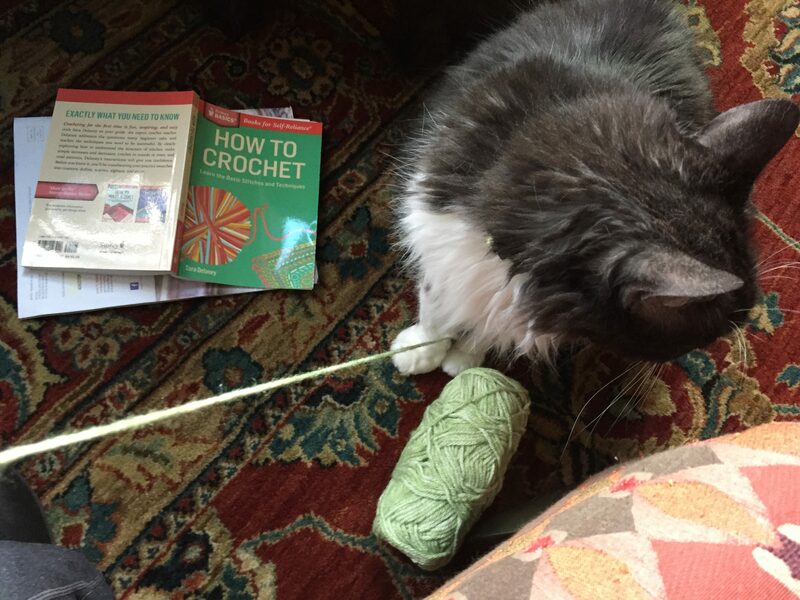 This entry was posted in Arts and Crafts and tagged beginning crochet, learning to crochet, lindy, Lindy-Lu, Mouse the cat, new hobby, stress reduction, Tall Tales from Chiconia, Tessa, The Snail of Happiness. Bookmark the permalink. She’s irresistible, Sue. She casts her kitten spell over everyone she meets. 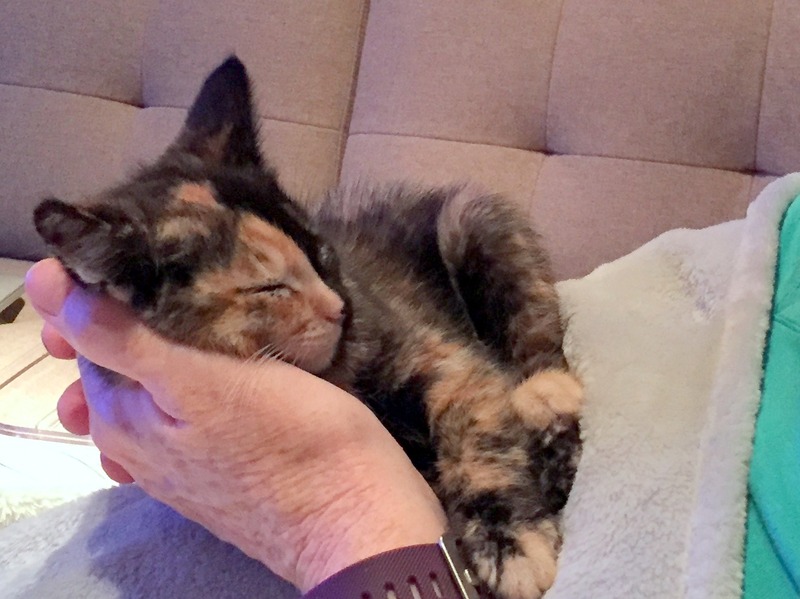 We look forward to sitting on the couch in the evenings, and trade off her soft, little warm body from lap to lap. My 17 year old son started a Tessa Instagram account. She has about 900 followers! !! I will go follow too 😀 901 ! Have fun! I am trying to make a poncho… if I ever get my head around the measurements! That’s what will trip me up: the math! I hope it’s not too difficult to sort out. Isn’t Kate a treasure? And she chose your favourite colours too. I find videos much more useful, as I can’t seem to understand crochet patterns and written instructions. I make up for that by often doing freeform crocheting, then I can make it up to suit me! Prudence Mapstone is one of the leading artists. She is, Anne. This was such a thoughtful gift. I agree with you on the videos: you can learn so much more that way. I love that you freeform crochet. I’m not surprised, either, with your incredible artistic abilities. And on my, Anne, I’ve gone to visit the Prudence Mapstone site. What incredible works of art! the colors are so rich, too. I could easily fall down that rabbit hole for hours. Thank you for sharing her work. Kate created a thing of beauty, and I’m lucky to be on the receiving end. I do believe I’m hooked! It will be fun to improve my skills so that I might make something useful. Thank you, Dawn. I’m so glad it does the job for you! Making things like this gives me quite as much pleasure as crochet seems to give other people, so if you guys keeping hooking along, I’ll keep making tool rolls for friends who want one 🙂 (Or paintbrush rolls, or makeup brush rolls, or knitting needle rolls…). I love how cats are irresistibly attracted to yarn; it seems fitting, seeing they’re equipped by nature with a full set of hooks of their own! Kate, your tool roll is fantastic. I’ve handled it way more than the hooks it stores, as it is just so pretty. But after all the supportive comments I’m receiving here, including one where Tialys suggests that crochet is easier in the summer because you can shift it to the side, I may pick it up again this week. You made me laugh with your “cats have hooks of their own” comment. True that. I’ve got an entire wardrobe of snagged t-shirts to back that up! That is impressive. I played around with a thin yarn early on, something I had on hand from another project, but it kept splitting so I set it aside. One day. You are a tool roll-making pro! Yay for you! Of course, with any yarn and hook work cats are inevitable. 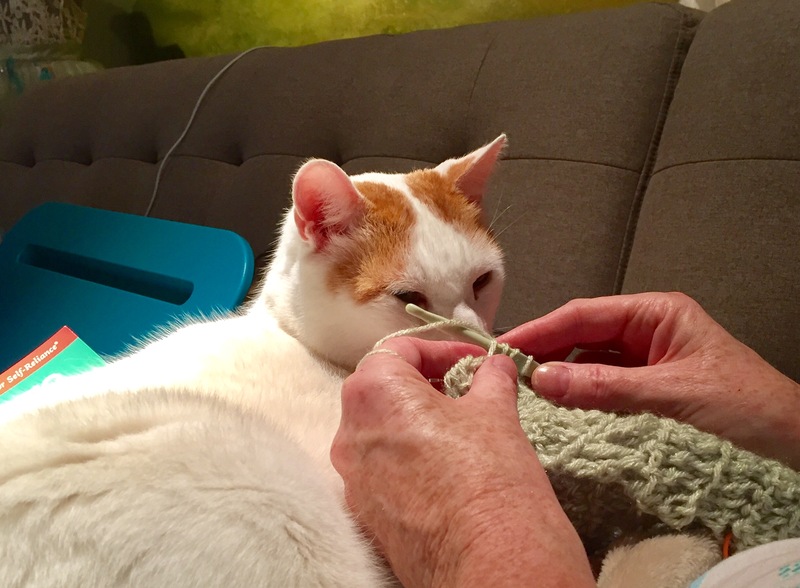 Orlando has really only recently stopped ‘helping’ me keep the yarn in order……. Your stitching is coming on in leaps and bounds if you showed your pics in order of progress. Love that blue combo (of course!) Joanna has spent the past year or so practising her crochet skills and we hit on the idea of her making squares in different colours and stitches so she could grow her repertoire slowly and surely and in the end it could all be hooked together to make a fabulous throw – a usable stitch compendium 🙂 Kate has made you the perfect roll to keep those hooks together – isn’t that a clever idea! And such lovely colours too. What a nice gift!! That’s very pretty and I like the way it rolls up. I also like your greens and blues. I think I’ll try to learn crochet once I retire. then I think I’ll feel as though I can do one project after another. I was just looking at felt today and thinking of a new order for sewing…something. I have crocheted things like potholders, but really, one would want to do scarves and shawls and things or blankets like Jan. I look forward to seeing more of your work. Now you have received a lovely crochet related gift you are committed! No giving up! I have to say that I have always been more of a knitter – also taught by my Mum who doesn’t crochet – but am really enjoying making blankets at the moment. It’s a slightly more ‘summer friendly’ craft than knitting because of only having that one stitch on the hook at a time so you can sort of move the weight of the work to one side. I flirted with crochet a bit around six years ago but stopped because I wouldn’t wear anything I made -accessories aside – but I do like a lot of the things you can make for the home. I paid for a couple of lessons in a local yarn shop and then did the rest on the internet where I could ‘pause’ and ‘replay’ to my heart’s content. You are so right! It’s hard not to remain committed after receiving such a lovely gift. Thanks for sharing your own experience. I love the combination blanket you’re making with both the crochet and the beautiful fabric. That is something I could aspire too. I’m the queen of pausing YouTube videos and replaying over and over till I sort something out. How different things are then they were even a decade ago. Quilting could be next. So many crafts, so little extra time. I really appreciate your encouragement! Thank you for the link… we are turning into the anti-Instagram! I too have a tool roll from Kate – I use it for hooks and dpns for my sock-knitting. I only learned to crochet five years ago. Like you, I learned to knit and sew as a child, but not to crochet. I started off making bath puffs (http://www.amyscrochetpatterns.com/2014/12/crochet-cleansing-bath-puff.html), which were great for a beginner because you don’t need to get your edges straight and the stitches aren’t very visible in the finished object. Once I’d got the hang of it there was no stopping me. Incidentally, I found learning from you-tube very difficult – I like a diagram that I can stare at for as long as it takes my brain to assimilate what’s going on! Once I’d got the basics, I went on a course and that gave me the confidence to read patterns and try out new things. You have already made a great start and I know you will get better and better! Thank you so much for your vote of confidence! I would never have guessed that you are relatively new to crochet! I feel encouraged to keep going. Even the book suggests thirty minutes a day, every day till you get smoother and faster. I really enjoyed it this last winter and spring. Sometimes it was even hard to put it down when I needed to get busy elsewhere. Perhaps what I’ll do is practice with the blue and white piece I have going, then take it to a shop for a lesson and some counsel. It’s interesting how we all learn differently: for some it’s audio, others visual and still others need to see the motor planning steps of things. Thanks for linking to the bath puff. I had a look at her instructions and think that might be a fun project to try. It’s small and portable too which is nice. Thank you, thank you! I’m glad you’ve got into crocheting, Alys. It is truly relaxing and produces quick results as well. Sadly, I’m having to lay off at the moment as crocheting aggravates the psoriasis on the palms of my hands but hopefully I will be able to take it up again in the autumn/winter. Lovely crochet hook case 😊. Oh Helen, what a shame. It is the heat from the wool/acryclic or the movement of the yarn across your palms? I hope you can revisit it once again. I love the tool hook! She even made room for my tiny scissors. It’s just perfect. The tool hook does indeed sound perfect! I think it’s the friction of the yarn across my palms. I wonder also if I might be allergic to lanolin. Psoriasis isn’t caused by an allergic reaction but surely any antagonist would make matters worse. Look at you go! I am not much of a crocheter but I went through a period when it saved my sanity–and Tialys just posted a photo of a fabric and crochet blanket that makes me want to take up my hook again! Your tool roll is gorgeous and such a generous gift–you’ll always know right where to find your hooks . . . unless Tessa or one of the other furballs decides they’re toys! The photos of the kitties melt my heart! Kerry, I read Tialys post after publishing this one, and like you, I would love to create a blanket combining beautiful fabrics with crocheted borders. She makes it look easy, as do you with your weaving projects. Your gorgeous scarves arrived just at the start of our hot weather. I’ll post photos in the fall when we can hang up the straw hats and the lightweight clothing once again. They’re wearable works of art, *and* they made Mike so happy. These kitties melt our hearts every day. Tessa has us laughing much of the time, too. What a character. And yes, the tool roll is both generous and gorgeous…not to mention hidden from a certain kitten for now. Yikes–when I think about the hot weather you’ve had, the idea of a wool scarf makes me itchy and twitchy! I’m going to do some experimenting with that quilt/crochet combo in my free time (HA!). I’ll keep you posted! I am cracking up at the “museum for hooks” because I am afraid that is exactly what that lovely tool roll would become at my house. It is gorgeous. I never got the hang of knitting. My grandmother (who was proficient at it) was horrified to see that I held one needle between my knees. I couldn’t seem to get the hang of casting off while holding both needles. So to not give her the creeps I gave that up. My mom is very good at crochet so a few years ago when I was visiting I decided I would like to make my son an afghan for his college dorm. She and I went to Hobby Lobby and picked out the perfect soft yarn in just the right colors and she got me started before I came back to VA. The pattern was simple and there are lots of ladies in my church who could help me. I would work on it in the evening when I came home from work but for some reason it was growing and growing. I had to go all the way to Fredricksberg to a Hobby Lobby to get more of the matching yarn. My mother was concerned. She said, “Amos, you shouldn’t have needed more yarn. Ask your friends at church to help you.” I did. Those dear ladies shook their heads and sadly suggested I take it out and start over. I cried. I took it all out. Rolled the yarn up and have not picked it up again. It’s not because I am too upset, it’s just that life got busy and I never made the time. I need a person to sit with, a class as you said. Someone suggested Youtube to me but I know I can’t learn to crochet from Youtube. I miss my momma at times like that. I need my momma. Come help me Alys. We’ll learn together. 🙂 Good luck friend. Looks like your projects are coming along beauifully. I’ll get mine done one day. Maybe I’ll have a grandchild who goes to Virginia Tech. HAHAHA. How fun to find a new relaxing hobby. I’m easily impressed by crafty people, because I seem to have gotten left out of the artistic gene pool. My hats off to you – enjoy! Thank you! I’m going to redouble my efforts this fall when the weather cools down again and it’s more conducive to having wool in my lap. She sure does, Marlene. I love his tool roll. I know all about projects mocking one to get a move on. I’m glad you found a good home for all your yarn with your niece. Serendipity! Thanks for sharing that little tidbit on the mistakes in the crochet books. That is good to know. Of course I always think “it must be me…why aren’t I getting this?” Funny that. As for cuddle time, Tessa is pretty insistent when she wants to be in your lap. Lindy is too big for my lap, but she’s always enjoyed draping herself across the back of the couch around my shoulders, which is where she is now. Mouse loves my time in the garden. He rolls in the catnip, nibbles on the tall grasses, chases lizards. He loves the outdoor time. Mike and the boys are more then happy to have Tessa in their lap, too. What is it about a warm kitten that renders you calm and immobile? It’s as if a spell came over all of us. Oh, coasters sound like fun. That would never have occurred to me. What I would love to do is make small blankets for one of our shelters using super soft, washable yarn. But…I need to improve my skills first. I’ll go check out ravelry. Thanks for the tip.